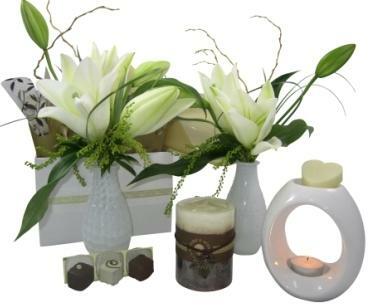 Gifts from Best Blooms Delivery Auckland | Gift Boxes in Auckland N.Z. Looking for thoughtful gift ideas - with FREE DELIVERY too? A gift box make a perfect present, and yes we can deliver your gift anywhere in Auckland! A gift set is where we combine flowers with gifts, chocolates, notebooks, candles, fragrance and body care products to make an attractive and great value gift package. Having gifts delivered is very thoughtful - such a lovely surprise, and of course we can send your present across Auckland. Gift Baskets & Pamper Hampers - Perfect for Birthday Gifts! Pamper Gift baskets for her are a great present idea for women, whether for Birthdays, Anniversary Gifts, Engagement Presents, or for Mothers Day or as a gift idea for Christmas. Order your gift online from our award-winning flower & gift delivery service, and we can send it today Auckland wide. What type of other Gifts do you have in Store? to see the types of gifts and lines we carry and can easily add to your gift box. (subject to stock availability). Please give our florists a call direct on 09 838 9058 to discuss what options we have available today for you. Home Delivery - Order cut-off 2.15pm. (please note home addresses are usually sent out on the afternoon run, unless requested otherwise) Saturday delivery order by 9.30am for same day gift delivery Auckland wide.